What is a Servicemembers Civil Relief Act Affidavit? 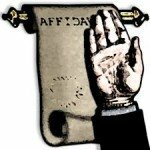 HOME > Blog > General > What is a Servicemembers Civil Relief Act Affidavit? A Service members Civil Relief Act affidavit is a document litigants can take to court to prove they have checked to see if the defendant in their case is on active military duty. An SCRA affidavit, which most courts require, helps move cases forward so plaintiffs can get restitution more quickly. If a faulty affidavit is provided, sometimes the plaintiff has to start the process over again. The SCRA offers certain protections to personnel on active military duty. Those protections are also offered to reservists who have received call-up orders but not yet reported for duty. Some protections continue for a period after termination of active duty. But that period will roll back to 90 days at the end of 2017 unless a law is passed to keep it at one year. Litigants may not take default judgments against active duty personnel. The law may also bar certain foreclosure and collections actions, as well as evictions. Before litigants can take adverse action, they must conduct a military status verification to determine if the act covers the individual. This includes a determination of the start and end dates of active duty. The government requires all military branches to update the Department of Defense Defense Manpower Data Center records when servicemembers’ military status changes. But the DMDC’s sole, unique identifier for inquiries is the individual’s Social Security number. If the plaintiff supplies neither the Social Security number nor the date of birth, the DMDC will not respond to the inquiry. With only the date of birth, the DMDC will include a broad disclaimer that says that they do not guarantee results. Courts frown on that and may make the plaintiffs start all over again. The DMDC does not provide affidavits. The Servicemembers Civil Relief Act Centralized Verification Service (SCRACVS) offers a more comprehensive and easier-to-use resource, and supplies verifications even without a Social Security number. You can find additional information distinguishing the SCRACVS from the DOD site here. Many courts have their own required forms for the military affidavit and may reject inconsistent versions. When ordering an affidavit from the SCRACVS, the user may request jurisdiction-specific formats. If the SCRACVS does not yet offer a format, the user may supply it and the SCRACVS will make it available to all users. Alternatively, the user might prepare his own affidavit, in compliance with local rules or customs, and attach a copy of the SCRACVS certification or affidavit as a court exhibit. Affidavits are NOT available through the DOD DMDC site. But affidavits ARE available from the SCRACVS and are sent within one business day of the order. Fedex delivery service is available. The charge for an affidavit is $20, plus overnight delivery charges. The purpose of the SCRA affidavit is to provide courts and other institutions proof of compliance with the law. However, it is important to note that the SCRA is not a blanket protection against all judgments, and if a servicemember becomes aware of a court proceeding or other adverse action, they should immediately consult a competent attorney for advice. To order your Servicemembers Civil Relief Act Affidavit, either log in or register.